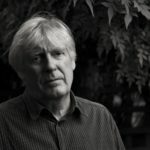 David Harsent, born in 1942, has published eleven collections of poetry, most recently ‘Fire Songs’ (2014). He has won the T.S. Eliot Prize, the Griffin International Prize, the Forward Prize and the Geoffrey Faber Memorial Prize. Sir Harrison Birtwistle, born in 1934, is one of the leading European figures in contemporary music. His works combine modernistic aesthetic with mythic power and emotional impact. His inspiration comes from contemporary art and the rituals of classical mythology and pre-history. He was knighted in 1988 and became a Companion of Honour in 2000. They chat at Birtwistle’s kitchen table in Wiltshire on an autumn afternoon, quinces glowing in the garden outside. Fergusson: How did your collaboration begin? Birtwistle: It began in 1984 with me travelling from Twickenham to Waterloo and reading a review by Peter Porter in the Observer of David’s book Mr Punch. What I took on board was the language. I could see that it had the essence of what I was looking for. I spend a lot of time reading verse, and one side of this is that I’m looking for a text to set. I always have that in the back of my mind as I’m reading – whether I would want to set it to music or not. So that’s how I heard of him. But I don’t know how I contacted you, David? Fergusson: And liked each other? Birtwistle: I don’t know. I can’t remember. Fergusson: Did it help that you came from similar backgrounds? Birtwistle: There is no background like mine. Harsent: Well, I’m working-class, and you’re a bit working-class too. Your dad had a shop, didn’t he? Birtwistle: Well, he had a shop at one time, and he was a baker, and then he bought a farm. He was a dreamer, was my father. He went through the First World War and he was in the Dardanells and at the Somme. I don’t know what he was doing from 1919 to 1934, when I came along. Anyway, I was born into what was a sort of bakery. My earliest memory is of sitting up in a high chair playing with lumps of dough. I wonder whether that was the beginning of my love of pottery. Harsent: My father was a bricklayer; my mother was a telephonist. I grew up on a council estate. It was a pretty rough place. You had to be prepared to trade blows. Somebody asked me recently what were the advantages of growing up on a council estate, and the only one I could think of was that I learned how to take a punch in the face and keep going forward. Fergusson: And how did you discover music, and poetry? Birtwistle: My mother encouraged me to play the clarinet. She used to say that I needed something to keep me off the streets. And in Accrington, where I grew up, there was a military band, and I played in that. Then after school I got a scholarship to the Royal Academy of Music – more for my composition, I think, than for my playing. Harsent: If you were a Baptist you could have a glass of cherry brandy at Christmas. If you were a Methodist you couldn’t. Anyway, setting off to Sunday school I fell down the stairwell, 25 feet. So I was in hospital for a bit, then laid up in bed at home, and my grandmother went to the library to get me some books. One of these was a bumper book for boys; in between the tales of derring-do there were poems. I didn’t know what they were, but I knew they were very disturbing, very exciting, and affected and moved me in ways that I didn’t properly understand. So I said to my grandmother could you go back to the library and get me a book full of poems like these, and she came back with Quiller-Couch’s Oxford Book of Ballads. The poems in the bumper book had been Border Ballads – death and revenge and the devil and mysterious goings on. I was completely taken up with the poems and could not stop reading them. Fergusson: Can you talk a bit about how your collaboration developed? Harsent: With Gawain we talked about it a bit, and there was some discussion about how it might open. But basically I just sat down and wrote it. Then I remember calling Harry after I’d been working on it for about three weeks, and saying, ‘I never thought to ask you this – is there to be a chorus?’ And you said, ‘Yes, I suppose so, it’s up to you.’ It all developed in a very interesting, organic kind of way. When I give Harry the words that’s when the collaboration really begins – when the weight of his composition starts to tell on mine. Fergusson: So it’s always that way round – words then music? Birtwistle: It has to be that way round. I couldn’t write music on spec. Harsent: If it’s a song or lyric, then the music will more or less follow the rhythm of the lines – a singer-songwriter’s technique. Take the Beatles’ number ‘Yesterday’, for example. Modern classical music doesn’t make use of text in that way – nor could it, given its nature and methods. Line breaks go for nothing, nor do my rhythms: it’s not the way things work. I suppose the short explanation would be that modern music isn’t straightforwardly tuneful or melodic. That’s a crude description but it’ll do for now. Birtwistle: Sometimes I find a small piece of text that sets me off. For example, in our opera The Cure I found a very small section from John Gower’s Confessio Amantis where Medea is going out to gather herbs to make a magic potion to rejuvenate Jason’s father, Aeson. Harsent: The opera lasts about an hour, but its origin was this tiny extract from Gower. Birtwistle: It was in all about ten lines. All we know is that Medea is gathering herbs, and we know why, and it’s moonlight and there’s dew on the ground, and she takes her skirt and tucks it into her underwear. Harsent: I think the line you particularly liked was ‘Sche glod forth as an Addre doth…’ So I gave Harry my modern English version of it, and he said, ‘But what’s going on?’ So I told him the whole story. We had already written a 50-minute opera called The Corridor, about the moment when Orpheus turns and looks back thereby condemning Euridice to Hades, and we could see that this – The Cure – could be the second half of the evening, using the same singers, the tenor Mark Padmore and the soprano Elizabeth Atherton. So I wrote a version of the rest of the story. Birtwistle: There was a problem and it was this. Jason and his father are both sung by the same singer, so technically how do you achieve the business of him getting younger? So in a sense what happens is that they’re becoming the same person at the end and we don’t know the difference. But that was your invention, wasn’t it David? Harsent: Yes, my invention. In the myth Medea makes the potion; she cuts the throat of a ram and the blood is one of the ingredients. Then she cuts Aeson’s throat and draws all the blood out of him and pours in this solution. But we wanted it to be a piecemeal process: Harry wanted Mark Padmore to go from incoherence to full melismatic aria in stages. Birtwistle: He’s almost dead at the beginning. Harsent: She administers the potion three times, but each time she administers it by kissing him. So it goes from her mouth to his mouth. And her fascination with him grows, and her sexual interest in him grows as he gets younger. So she doesn’t take him back ten or even twenty years. She takes him back until he’s a man as young, as capable, as handsome as his son. At the end of the piece, she is unable to tell one man from the other, and can’t tell which of them she’s in love with. All this came from Harry finding that tiny bit of Gower. Fergusson: When Harry’s come to you with ideas, have you always felt excited by them? Harsent: Harry’s never suggested to me something that I either didn’t want to do or felt I couldn’t cope with. We tend to have the same responses to the material we’ve chosen. For example, when we started talking about our two-act opera The Minotaur  we agreed that we wanted it to be a spare piece, not to crowd the stage. And I said, or one of us said, why don’t we start with Ariadne on the beach in Crete, waiting for the ship which contains both Theseus and the Innocents. And we both immediately agreed to this. Birtwistle: There was one thing that needed to be solved dramatically. If you have a bull, or a half-man, it’s very easy for him to play a bull, and make bull noises, but how does he become coherent? David achieved this brilliantly I think by having his half-sister Ariadne go to him in the night as if in dream – and she can talk to him and that’s when he becomes coherent, and it’s the first time he sings. Harsent: I had thought initially that the Minotaur might just roar, might not have a central singing role. So, for example, when we were in the labyrinth and he was killing the Innocents and so on it would be a bloodbath – lots of roaring and screaming. Birtwistle: That’d be the easy bit you see. Harsent: But then I discovered that the bass John Tomlinson had been given the role, and I thought, ‘Well, John Tom will need a few lines.’ So I decided that the Minotaur would be able to speak in sleep – in dream – and the only time he’d become coherent while conscious would be when he was dying. Birtwistle: Sometimes problems have to be ironed out in workshop. For example in our opera The Corridor  about the myth of Orpheus and Euridice, we couldn’t quite work out where Euridice was going to go after Orpheus had turned and looked back, so condemning her to return to Hades. If her movement back towards life was taking her stage right then she’s got to turn back – back towards Hades – and go stage left; but were she just to keep going, she’d be through the wings and out into the street. So we had to find a way of bringing her back to her position on stage when he turned. She was downstage at this moment – in fact her journey back to Hades took place downstage, and in successive stages. The only way of doing this was to take her upstage, so that from being downstage and moving let’s say stage right she then had to be upstage and moving stage left to get back to where she started from to continue the journey down to Hades. Harsent: So how would we get her upstage and then find a logic by which she could traverse the stage and return to her first position? There were theories we might gauze the upstage area and so on and so forth. But I knew that Harry wanted her to have a conversation with the onstage musicians – an exchange during which they would give musical answers to her sung questions. And it occurred to me that if she were out of character when she was upstage, then she could be commenting on her role as Euridice and asking the musicians questions about her own character and the story she was enacting. By that means she could be upstage and move to the other side of the stage, having had this interplay with each of the musicians. She then gets back to where she was when Orpheus turned and looked back and she can start her journey back to Hades again as if it were a different section of the same journey. And this repeats. The second production was, as before, designed by Alison Chitty; Martin Duncan directed; but things had changed, both in design and in direction. It was a triumph. Birtwistle: But more than that we needed a different delivery from Liz Atherton during those upstage moments – the exchanges with the onstage musicians. Not song; not quite speech. So I took the text and didn’t write any music for it but I notated the rhythm of it, and I said ‘but you must use natural speech inflexion, absolutely natural’ – but it was to be completely synchronised with the music of the six musicians on the stage. She was taught by the director, Peter Gill, and she did it in the end. What I wanted was natural speech inflexion, and then a sort of freedom within the rhythm, but absolutely synchronised with the music. It’s one of the few times I’ve heard it when it’s absolutely convincing. Harsent: That second Aldeburgh production was wonderful. Harry and I sat there at the dress rehearsal almost in tears – or I was, anyway – because it was just, well I can’t think of a better realisation of the piece we wrote than that. Fergusson: Can you say something about your collaborative method? Harsent: Well, take The Minotaur as an example. While I was writing the piece, there were a couple of times that I rang Harry and said, ‘I’m thinking of doing this or that, what do you think?’ We would have a brief discussion, but there was never conflict. But, as with any piece, when I finished it and handed it over and Harry started composing, that was when the piece really began to come clear. The weight of his composition started to tell on mine. So there was an instance, for example, when Harry rang me and said, ‘Look, Ariadne has just tried to do this deal with Theseus. She’s told him that getting into the labyrinth to kill the monster is easy enough; the problem is going to be getting out. Even Daedelus, who designed it, couldn’t do that. So she says she will help him devise a way to do this if he will take her back to Athens as his bride. And he turns her down.’ Harry said, ‘Look, you’ve got this moment, he’s just rejected her, but then what happens?’ And I said, ‘Well, I guess it’s stage to black, re-set.’ And Harry said, ‘No, she needs something: a response.’ And he was absolutely right. I just hadn’t found the correct weight of that moment. So I said, ‘OK, what?’ And Harry said, ‘I don’t know – a lament of some kind.’ And I said, ‘OK, yes, you’re right. How long?’ And he said, ‘Not long – about six lines.’ And then he said, ‘Make it dark.’ And I said, ‘Well, as you know, dark is my default mode.’ And he said, ‘Well make it darker.’ So I wrote this aria for the mezzo-soprano Christine Rice (who sang Ariadne) which started ‘The Cretan sun is black’. And when she sang it in the rehearsal room everything stopped. She sang out – not saving her voice – and it was electrifying. Tony Pappano, who conducted the piece, said to me, ‘This is you and Harry at your best.’ And I said, ‘If Harry hadn’t asked for that piece it wouldn’t be there.’ It’s a moment in the opera that brings me to tears. It epitomises what’s special about our collaboration because it’s an instance of where together we found the perfect balance for a scene, and produced a moment of great intensity. Fergusson: Do you always go to the rehearsals of your pieces? When the music and words are written is there a sense in which they’re not yet finished? Birtwistle: In a rehearsal you feel you’re still in touch with the piece. But to see it begin to happen is all part of making it. I can’t just put something in the post and not listen to it. We can still have contributions to make – the implication of what’s there can still be hidden. Harsent: Sometimes an actor-singer will say, ‘I don’t quite know what I’m doing here.’ There was a moment in the second production of Gawain in the Royal Opera House when I had coffee with the sopranos Marie Angel and Liz Laurence, who sang Bertilak’s wife. And Marie said, ‘Liz has this line, “I’m twinned with another woman – dingy, wild, deadlocked by knowledge.” In what sense am I twinned with Liz? What’s the connection?’ And I said, ‘No! She’s talking about herself.’ I didn’t go early to the rehearsals for Gawain, but I might well have solved that problem if I had. But a lot of the time I’m just hanging around loving the process, watching it take shape, but if someone has got a question about my text or what I meant when I wrote it, I’m there to answer it. Fergusson: You’ve worked together for over 30 years now. Has there never been a falling out or an awkwardness? Harsent: Never a cross word. I remember saying in a podcast I did for the Royal Opera House at the time of The Minotaur, ‘If Harry and I had a dream about this opera it would be a different version of the same dream.’ Harry remarked to me once that when you’ve made a mark on a canvas, everything proceeds from that mark. He was thinking of Paul Klee’s notion of taking a line for a walk. Klee was talking about a drawn line, but you could be talking about a line of poetry or a line of music. When Harry and I are working on a piece together, we just seem to be walking the same path. Birtwistle: I’m very conscious of where ideas come from. In my case it’s visual. For example the idea of seeing that bull creature manifested. Or the Green Knight’s horse. Or the business of Gawain cutting the Green Knight’s head off, then having the Green Knight lift the head up and it sings. I’ve said in jest that I only do myth and animals. It’s a sort of childish thing. Harsent: I remember you once said to me that one of the things that made you think Gawain was something you wanted to do was that you wanted to see how they would make a noble pantomime horse! Fergusson: Can you talk about your working routines? Harsent: I get up every morning to write and did even when I had to have a full-time day job. All poets need day jobs, so everything is interruption. Some interruptions are less painful than others, and writing commercially was largely speaking less painful than being a publisher, because I could organise my own time. Now I have fewer interruptions. I go to my study at about 9 a.m., then break for lunch. I usually stop for the day in time for the news at 7 p.m. on Channel 4. I recently handed in a new collection to Faber so I wasn’t expecting to be working on poems for a bit, but then I woke up with two or three lines in my head, and went upstairs in my pyjamas to work on them and finally emerged some time in the afternoon. Artists are obsessives. Fergusson: What next for the two of you? Harsent: No plans at the moment. Birtwistle: You can’t write an opera without a commission. You can’t work on something for three years and find it’s not going to happen… Will you ever do anything about that bestiary we’ve talked about? Birtwistle: Shall I nag you?